Robb Wolf, a former research biochemist, is the New York Times Best Selling author of The Paleo Solution – The Original Human Diet. A student of Prof. Loren Cordain, author of The Paleo Diet, Robb has transformed the lives of hundreds of thousands of people around the world via his top ranked iTunes podcast, book and seminars. Robb has functioned as a review editor for the Journal of Nutrition and Metabolism, is co-founder of the nutrition and athletic training journal, The Performance Menu, co-owner of NorCal Strength & Conditioning, one of the Men’s Health “top 30 gyms in America”. Robb is a former California State Powerlifting Champion (565 lb. Squat, 345 lb. Bench, 565 lb. Dead Lift) and a 6-0 amateur kickboxer. He coaches athletes at the highest levels of competition and consults with Olympians and world champions in MMA, motocross, rowing and triathlon. Wolf has provided seminars in nutrition and strength & conditioning to various entities including NASA, Naval Special Warfare, the Canadian Light Infantry and the United States Marine Corps. 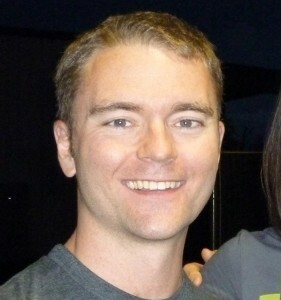 Robb lives in Reno, Nevada with his wife Nicki and daughter Zoe. 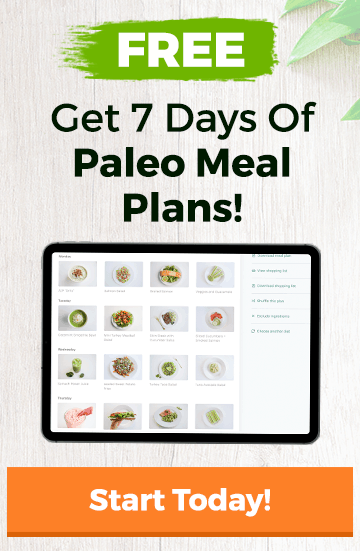 Robb Wolf’s 30 Day Paleo Transformation is a complete guide to your first 30 days on the Paleo diet, much like our own 30 Day Challenge. This guide includes a meal plan, shopping lists, and an exercise guide to get you started with the paleo diet. Robb Wolf’s Paleo on a Budget Guide is full of simple and practical tips, tricks, and strategies for saving money while eating paleo. 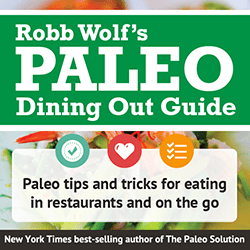 Robb Wolf’s Paleo Dining Out Guide includes tips on what to order in restaurants, tips for getting the most paleo items, and trips on consuming alcohol while living a paleo lifestyle.